Mary Minock’s well researched and well written The Way-Back Room is a sad book. Some passages, written in the author’s honest, but controlled voice describe such wretched events that readers may be shocked. These are the memories of a forlorn and lonely child who deals with borderline poverty, an oft-crazed mother, and the pre-Vatican II Catholic church. The Way-Back Room is a memoir. As such, it recounts both expected and unexpected events. A struggling neighborhood of a big city, a child’s unfortunate early life, her loneliness after the death of her father, and her struggle with harsh schools (Catholic schools, nuns, and priests in this case)—these are all somewhat expected topics in many memoirs; and when they fall on the dreary side, may remind us of characters or environments one reads about in Dickens or even Thomas Hardy. But The Way-Back Room also deals with a precocious child’s awareness of her sexuality, with her ecstatic love of certain saints and her romantic cast on religious and sexual feelings that she did not understand. In all of this, Ms. Minock maintains her objectivity in reporting such feelings as passionate childhood crushes on Davy Crockett or a Detroit Tigers player—experiences filled with physical and emotional yearning, experiences not understood. Irony is the source of power in this author’s hands. For instance, plain, short words and simple sentence structures strengthen the author’s account as a child eagerly listening to a cruel bare buttocks spanking of a childhood friend—and then her changing feelings as a young eavesdropper. Combining use of sensual detail with unexpected or oppositional events often produces a poetic tension as when the child “listens” to the spanking. The scene is more powerful told aurally than if the child were actually watching. In another instance, Ms. Minock recalls identifying a neighbor by hearing her high heels click on the pavement. The theme of sound defining experience runs throughout The Way-Back Room. The book starts with an epigram, a poem about hearing the foghorns of freighters on the Detroit River. The author recounts music in such sounds. Even tempered with the child’s ingenuous interest in music (one that becomes a lifelong passion), many sections of The Way-Back Room—no matter how lyrically expressed—are brutal reading—especially so in the passages of realism reported in an impersonal, detached voice. In spite of the artful handling of the early years’ experiences, ecstatic or miserable, these only provide the background music when compared to the major struggle: the author’s mother’s hoarding. This emerges as the central subject of the book; the bizarre collection of stuff in the way-back room of the flat becomes the monster that drives this memoir. Once she introduces it, Ms. Minock never quite abandons this central issue of hoarding. She goes back to the stuffed room in memory again and again; often she makes long lists of the items that pack the room; and even more appalling, she often cites the history of an object as well as that of its container or packaging. These long, explicated lists render the back room eerily alive—especially when there are changes in its contents, changes that occur within and outside of reason. If the documented ugliness of the hoard isn’t enough, the way-back room becomes the battlefield: the source of the terrible and frequent arguments between the child and her mother. The child tries to clean and bring order to the room, often in secret. When she is caught, her mother reveals herself as a raving, unreasonable, and dangerous shrew. At times, the child seems a pawn to her mother’s maniacal games. Readers reading such scenes may feel emotionally twisted when, later, Ms. Minock recalls long mother-daughter talks on the flat’s second story porch swing or the two of them singing the popular songs from The Hit Parade. Or perhaps this complex push and pull of a mother-daughter relationship is more the norm than we’d like to admit? The Way-Back Room is full of darkness with occasional light, but even so, the light is flickering or illusive. 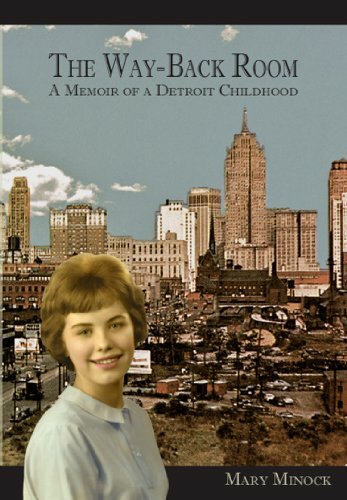 If readers who know or knew Detroit and environs in the 1950s are expecting a book that delivers the city’s once rich variety of neighborhoods, they will be disappointed. Although the description of the author’s childhood home turf is meticulously written, it is mostly confined to the city’s southwest area, downriver. Ms. Minock is a major talent, writing The Way-Back Room with more objectivity than subjectivity, its detachment lending it a certain matter-of-fact truthfulness unusual in a memoir. The Way-Back Room approaches some of the best of modern realism. It’s a worthwhile, engaging read.